I’ve been waiting for both these books for some time. A modern way to cook by Anna Jones is the follow up to her bestselling book from last year ‘a modern way to eat’. I think I made almost everything from this book during my year eating on vegetarian food and I was amazed at the simplicity of the recipes and the accessibility of all the ingredients. This new book has a similar vibe to Jamie’s 15 minute meals. Boil a kettle, have some pans on, bish-bash-bosh food in 15-30 minutes (mainly). It’s hardly surprising as she has worked with Jamie on other books and series – focussing on style and behind the scenes things – maybe she’s responsible for the awesome chopping boards he throws the food on!?. I can’t wait to cook from this book. It’s full of quick and easy recipes for when you just can’t face a couple of hours in the kitchen. 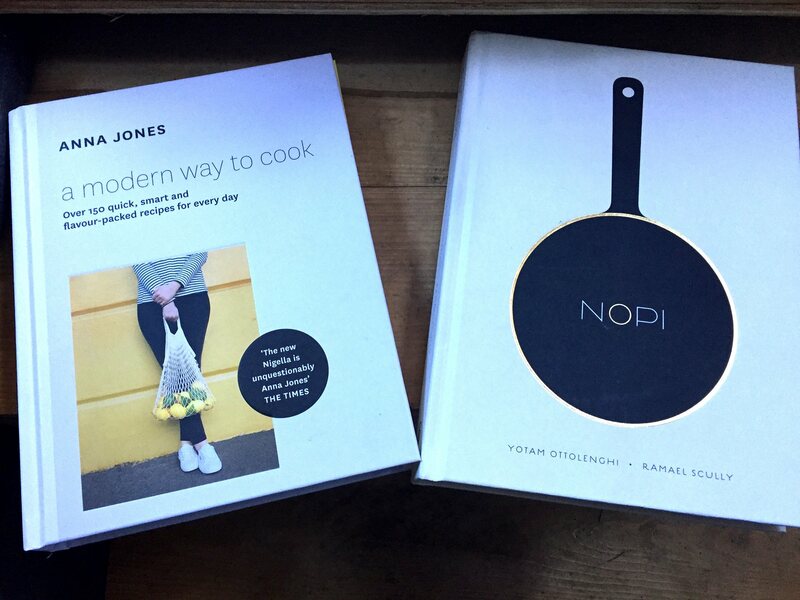 NOPI by Ottolenghi is another matter. This is the first book he’s released where I’ve thought ‘I really must read this recipe carefully before I start’. Most of his other books are throw it together, medium duration dishes, that pack tonnes of flavour and leave you feeling warm inside. This book is more refined. You can tell this by the gold edging on the pages! This book also sees Ottolenghi cooking with meat and fish (his last books were generally vegetarian). I love this. I love cooking vegetarian – but the odd meat dish here and there is very welcome.! The recipes in NOPI will take you a while, and in some cases you’ll be prepping them the day before. Especially the desserts. I can’t wait to cook from these books. And I can’t wait to blog about them! Another dish from Yotam Ottolenghi’s Plenty More, I made this last night after we’d already had our evening snack of halloumi wraps. We eat out at lunchtime way too often for my liking and every time it costs us over £10. It soon adds up – and it eats into the day. It’s rare that we can go out for lunch in less than an hour. Worse than that we never eat healthily at lunchtime. Fast-ish food is never that going to be healthy in Hatfield. I knocked this up pretty quickly (maybe 35 minutes) whilst watching the new David Attenborough series ‘Life Story’. You have to see it – it’s shot in 4K – gorgeous photography! Anyway, this recipe is quite easy – finding dried mung beans is the hardest bit. I found mine in a turkish supermarket. I’ve since been assured that many indian shops stock them. Cook some mung beans in water until they are done but still have some bite. While they are simmering away, cook some carrot batons in very little water with a little sugar and salt. When both the mung beans and the carrots are nearly done, fry some fennel seeds, caraway seeds and cumin seeds in a little olive oil until they pop. 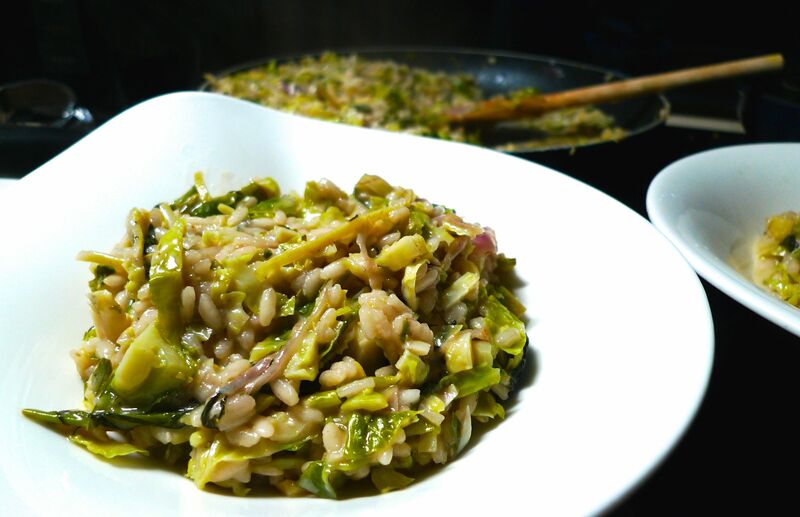 Drain the mung beans, add the popped seeds and toss together with some garlic, white wine vinegar and chilli flakes. Let is cool down. Finally, add the carrots, chopped coriander, lemon zest and diced feta and gently toss together with a little more olive oil. This really is a tasty dish and one I will be making often. It’s very filling, has many textures and is very colourful. Leaving it overnight to allow the garlic and vinegar to soak into the beans makes all the difference. Ottolenghi strike again. I’m really looking forward to making ‘Red Onions with Walnut Salsa’ on Thursday when I cook again. Tuesday’s is now ‘Free Sausage and Mash’ with a pint night in the ‘Horse and Groom’ in Old Hatfield. You really can’t turn that down ! We had it last week and the sausages were excellent – coming a close second to the amazing gravy that covered them ! Artichokes twice in a week. And why not! This is another great recipe from Yotam Ottolenghi’s Plenty More. Now I’ve made everything I set out to make from the first 100 pages of the book. Today I looked at the next 75 pages and have already earmarked another 15 dishes. This is one seriously good book. Since buying this book I’ve bought many more but it doesn’t look like I’ll be getting to them anytime soon as this book is so so good. Even pouring loads of vinagrette over the book by accident hasn’t reduced by excitement. If only I had PDF’d it sooner – then it would have just been an iPad that needed to be wiped clean! Ottolenghi says in his book that this isn’t as exciting in appearance as most of his dishes. I disagree. It looks great. More importantly it tastes fantastic and is pretty easy to make providing you have all the ingredients. Fregola isn’t something you just find on the shelves of every supermarket. I ended up ordering mine from Amazon as Ocado were out of stock. They are all essentially the same although moghrabieh is quite a bit larger than fregola and does take more time to cook. This dish is made all the better with the garnish of a green chilli pesto which you drizzle over the top when you’re ready to eat. The pesto is simply some green chilli, olive oil, preserved lemon, parsley and garlic all blitzed together until almost smooth. My trusty Nutribullet came into action again and did a great job. The Pilaf is very easy to make too – and doesn’t take that long. Caramelise some onions and then add some butter, the fregola, artichokes and stock and cook until the fregola has absorbed all the liquid. 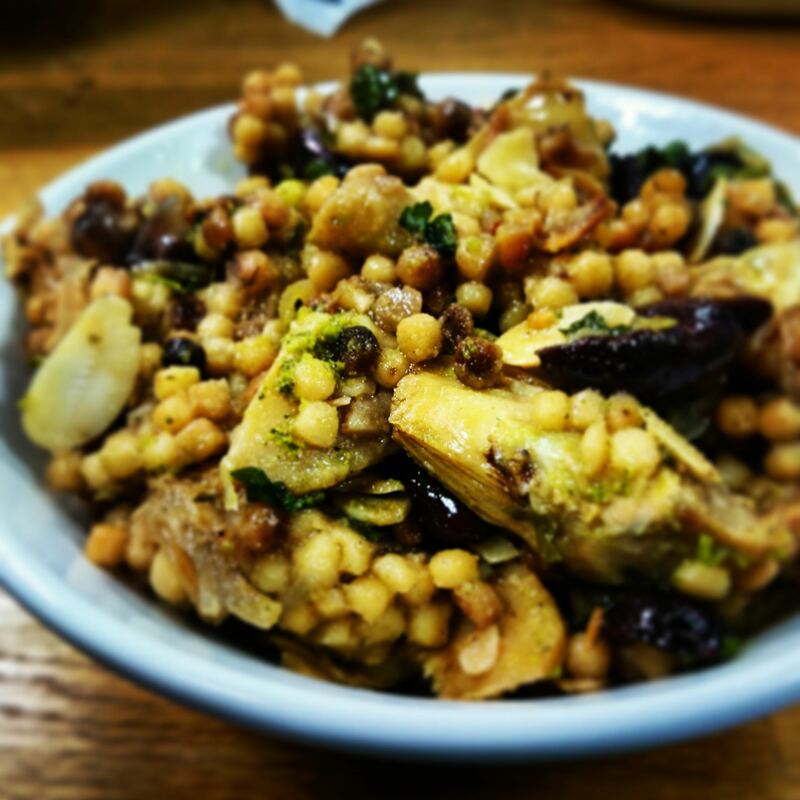 Stir in some torn Kalamata olives, toasted flaked almonds, red wine vinegar and chopped parsley and you’re done. I can’t praise this dish enough. I could eat this everyday. It is very tasty and really hits the spot – and is very filling. It keeps well too – in fact it tasted better the next day when we reheated it for lunch at work. I guess all those flavours just infused even more into the fregola! Neither of us really fancied dinner this evening; both having eaten out for lunch at work – but we always need lunch! So I knocked this up for tomorrow’s lunch. A traditional waldorf has apples, celery and walnuts dressed in mayonnaise on a bed of lettuce. This recipe from Yotam Ottolenghi’s Plenty More swaps walnuts for hazelnuts and there is the addition of red cabbage, red onion and sour cherries (I used barberries which are pretty similar). This is pretty easy – and pretty quick – I think it took a little more than 30 minutes – but only because you have to toast the hazelnuts gently for around that long alone. Mind you while they are toasting you can easily do the rest. 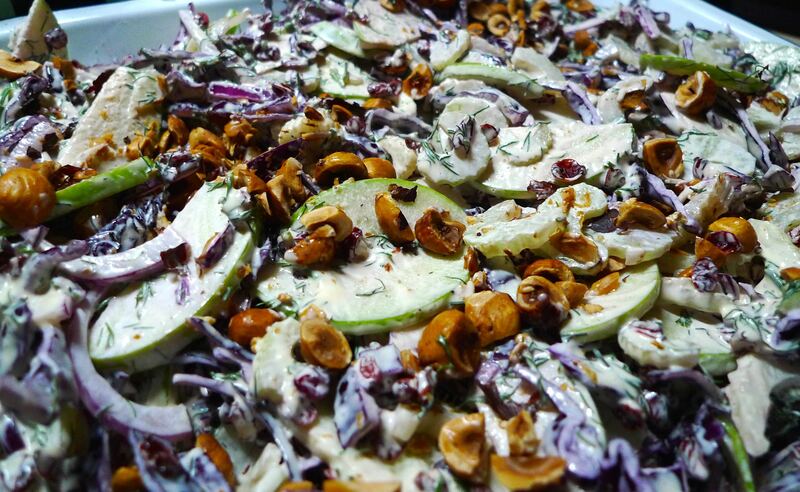 Finely slice red cabbage, red onion, apples (granny smiths), celery and toss together with some dill and sour cream. Then make some mayonnaise. I did mine in my new Nutribullet blender (this little beast will blitz anything to a perfect puree). The mayonnaise is made with a shallot, dijon mustard, cider vinegar and a mix of sunflower and rapeseed oil. And it was amazing. I don’t think I’ll ever buy mayonnaise again. Mix the mayonnaise with the salad, scatter with your roughly chopped toasted hazelnuts and you’re done. I think this salad is amazing and might be nice with something on the side – or even in a wrap with some Halloumi. I do love my salads though and I could eat tonnes of it on its own. One of the big problems of winter and living on the boat is taking nice pictures of the food you make. Now that the clocks have changed it will always be dark by dinner time and we only light the kitchen and lounge with LED reading lamps so most of the pictures look dark and shadowy. Also, I’ve stopped using my iPhone and have switched to Android and I really don’t like the camera, so now I’ve switched to my Lumix. More effort but hopefully more worthwhile. This one didn’t come out particularly well but I can assure you the salad itself was amazing. It’s another sub 30 minute salad proving you do things in the right order and don’t stand around waiting between stages. This dish like everything this week is from Yotam Ottolenghi’s Plenty More. I’ve only looked at the first 100 pages and I’ve already selected 12 things I want to make. I could be on this book for quite some time! This is another incredibly easy salad to make. It is a little messy; peeling beetroots always is – but they are a lot better than the peeled, precooked and prepackaged ones you get in a supermarket. Once you’ve peeled your beetroots, slice them thinly (about 2mm) and blanch them until they are cooked but still have lots of bite. I did mine for about 3 mins as I love raw beetroot anyway. The thinner you slice the beetroot, the easier it is to eat raw (or less cooked)! Once blanched and drained, mix with some sliced red onion, sherry vinegar, olive oil, caster sugar, seasoning and chilli paste and leave for around 15 minutes to infuse the flavours. While you’re waiting blanch some peas and refresh them in cold water. Slice a couple of avocado’s too while you’re at it. 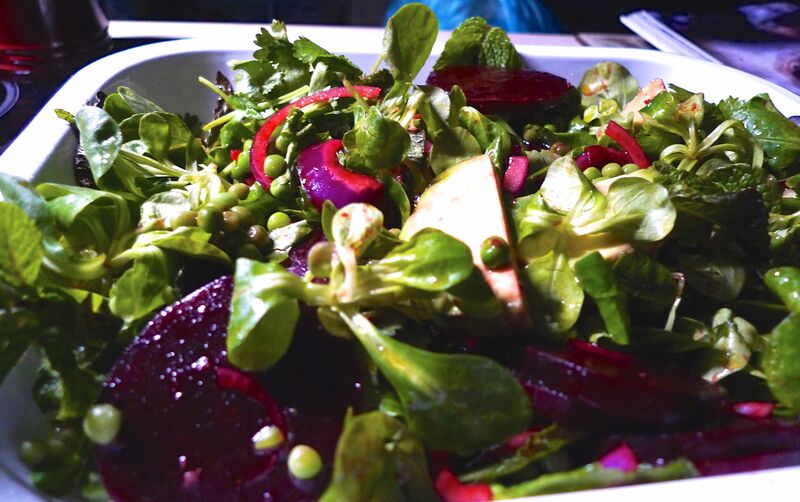 When you are ready to eat, grab a big serving dish, and toss pea shoots (or lambs lettuce like I did), the peas, the beetroot and the avocado together. Tear in some mint and coriander and dress with some more olive oil and you’re done. This is very fresh and very tasty. Proper beetroots can’t be beaten – never buy the packet ones! I resisted the temptation to use one of my crazy chilli pastes and just went for something mild. I don’t think Freya would have appreciated it and I imagine an overpowering of chilli would have totally spoiled the dish – so go easy on the chilli! The UK weather has been so mild of late that is seems almost normal to put together a cold salad for dinner on 27th October 2014! I was expecting to come home to a cold damp boat every evening and be heating the boat to keep warm but it just hasn’t been necessary. After spending an eternity in the IKEA returns department and then another eternity spending the store credit we got home quite late and were both feeling pretty hungry. Fortunately this dish can easily be put together in less than 30 minutes. 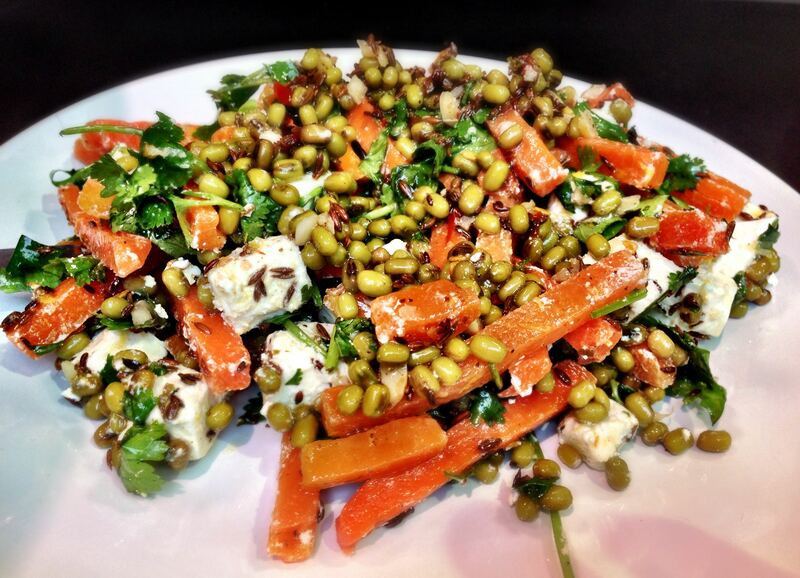 After bashing together an immediate snack of toasted pumpkin seeds with tamari, I set to work making this awesome salad. The salad is courtesy of Yotam Ottolenghi’s Plenty More. It does require really fresh ingredients though or it will just disappoint you. Last week we bought some Dill and Mint from our local Morrisons and it was tasteless, chewy and limp and really let down all the dishes I made. Contrast to yesterday when I asked for mint from our local greengrocer and he went out the back and got me the freshest, most aromatic mint I’ve had for ages. It really is worth shopping around for your herbs! Anyway – there are two ways of making this dish; the hard way or the easy way. The hard way relies on you being the master of artichoke preparation and having lots of time on your hands. The easy way uses them from a jar or frozen. We don’t have a freezer on the boat so I plumped for jars. The only cooking involved here is candying some lemons. 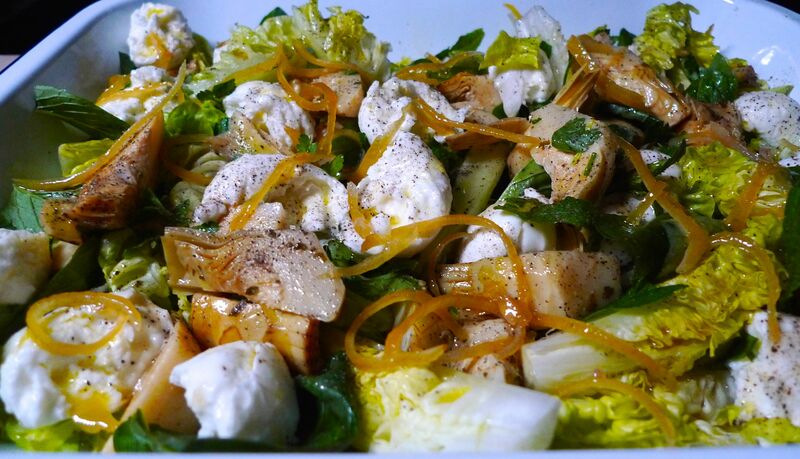 I really recommend you do this rather than copping out and just adding lemon rind, as the sauce and the sweetness from the lemons really sets this salad apart from the rest. To candy lemons, remove the rind, cut into 1mm batons and cook down in lemon juice and caster sugar until the liquid reduces to about a third. Remove the lemon batons and allow to cool down. Keep the sauce for the dressing of the salad. All that’s left is to cut some little gem lettuces, tear in some mint, parsley and basil and top with your quartered artichokes and torn mozzarella. To serve, dress with some olive oil, your candied lemon and lemon syrup and some black pepper. This salad is so fresh and tangy. The lemon hit might seem too much to start with but I found it really lifted the salad. The mozzarella, artichokes and lemon went really well together and it really was a meal in itself. Albeit a late one! Fortunately for us we had loads left over so we have a very nice lunch to look forward to today!